It's been a long time since I introduced the ROU "series," so it's high-time I added another tool to this list. This time I bring you a tool I just discovered- thanks to the geniuses on the internal Telerik Newsgroups- called Xenocode Browser Sandbox. The "tool" (it's really more of a service) enables you to launch browsers "from the web"- including IE6, IE7, IE8, Opera, Safari, and Chrome. Here's the basic tool pitch: You visit the Browser Sandbox page and download the executable for the browser you want to use (it comes in Xenocode's virtualized package). You run it- no installs required. The browser of the version you selected opens and runs! Clearly, the coolest part of this is that you can finally run multiple versions of IE on the same computer without all the hassle of firing-up a VPC. I tested IE6 on my Windows 7 workstation and it definitely works as promised. There are some shortcomings- for instance, I couldn't enter any text in inputs on webpages (no keyboard input)- but if your goal is to just navigate to a page to see how it looks, you're set. For a free tool, it's pretty cool. Check it out and stay tuned for more cool ROUs. Typing in IE6 works as advertised on my machine. You could try in some non-beta OS. @Anon- Good to know! I figured it could be a Win7 issue. Thanks for the additional info. Where do I download Windows 7 from? BTW, I have a MSDN subscription. @Asit- I think MSFT has shut-down Win7 downloads. If you're part of TechNet, you should receive a Win7 beta DVD in the mail. Otherwise, I think you'll have to grab the bits from someone that's got 'em and then get a key from MSDN. When you say part of TechNet, do you mean if I get the magazine in the mail? Yes I do. You are right. I just checked MSDN subscribers download area. They have shut-down downloading :( I was waiting for my new PC so that I'd have enough space and memory to install a Windows 7 VPC. I guess I am too late. That is sweet! By the way, their lBreakout2 game is very quality too! 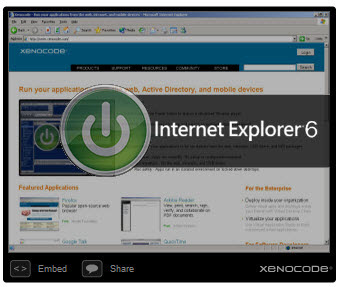 For example, on one PC, the installed IE7 was no longer running after using the Xenocode tool. As alternative to the Xenocode browsers, there is also IETester (http://www.my-debugbar.com/wiki/IETester/HomePage) which allows to run any version of IE and of course the portable versions of firefox (http://portableapps.com/apps/internet/firefox_portable/test). @Martin- Great info! Thanks for sharing. Those are definitely good alternatives to the Xenocode browsers.